Tramigo T22 is the world's first truly plug and play portable tracking device available for all the GSM markets, more than 220 countries and areas. Tramigo T22 can be used for hundreds of different purposes and in as many ways; when ever you need to know where your loved ones or your assets are and what is their current status. You can use T22 with text messaging in your local language. Tramigo has inbuilt map of your area with thousands of landmarks and allows you to add your own landmarks such as home, office and friends. You can simply check the location of your important assets and loved ones with user-friendly SMS commands. Tramigo T22 needs only a normal SIM card (prepaid or postpaid) of any operator and is ready for use, there are NO other charges than the text messages sent or calls made from Tramigo T22 to your phones. Tramigo M1 Our M1 S60 software makes Tramigo tracking units even easier to use via menus so you don't have to remember any commands. How and where Tramigo T22 works? Tramigo T22 combines the GPS (Global Positioning System), GSM (mobile network) and geographical information (TLD Tramigo Landmark Data) into one device. Tramigo T22 uses the GPS satellites to position itself getting very accurate positioning, then it finds the closest TLD landmark to that point from its internal memory and send the information across to any authorized mobile phone as a text message using the GSM network. Tramigo is commanded with simple text message commands; sending word Find or letter F to your Tramigo T22 you will get the actual location of your Tramigo back to your phone as a message. Simple, intelligent and very secure. Tramigo T22 is multilingual and is currently available with local landmark information to your country and over 220 other countries and areas. Please get in touch with us for the best way to purchase Tramigo T22 in your country. Tramigo T22, GPS that really works! Just add a pre- or postpaid SIM card and track any movable asset with your mobile phone. T22 is affordable with attractive, multi-language design and easy-to-use features. The first GPS Product available with local TLD landmarks to any GSM market. Unique New Product to Increase Brand-awareness. Be The First in Your Market. Every Day Peace-of-Mind Tool. Where are my loved ones? Special Editions available also for Motor-bike and Marine Use! Tramigo is a completely new and unique way to track and guard your assets and loved ones. Tramigo T22 combines mobile technology (GSM) with satellites (GPS) and can be used with any mobile phone. No monthly or annual fees, you only need to add a local SIM card and your tramigo T22 is ready for use. Up to 10000 in-build pre-loaded landmarks of your country •Nationwide and regional coverage • 220 countries and areas covered now • User can add customized locations, such as home, office etc. Tramigo Landmark Data is exclusively available in Tramigo Devices. This new, patent pending GPS data standard, makes Tramigo easy-to-use and affordable; T22 is truly the first GSM-GPS device for consumer users. Tramigo T22 comes always with preloaded local landmarks of your country. TLD landmark data is available for all the 220 GSM countries and areas. Tramigo is now actively looking for partners in all the GSM countries; more than 220 countries and areas. Please apply now! 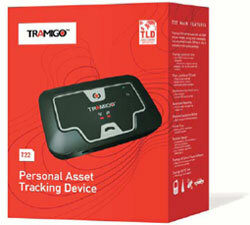 Tramigo T22 Personal Asset Tracking Device is a product of Tramigo Ltd. headquartered in Espoo, Finland. Pat. Pending.